It's crazy that it's been a whole week since we gave Monkey his first ever mouthful of food. It's become such a regular thing to do during the day, that it feels like he's been munching away for months. It took us a couple of days to get the timings right for when was best to serve up his lunch, but once we had it right he was eating like a pro. The first mistake we made was giving him his lunch when a bottle was due, he wanted the food but at the same time got distressed as he had to wait for his bottle. Second mistake was making the consistency too sloppy, he much preferred a lumpy, gloopy porridge. Final mistake was feeding him in the wrong location, he's not quite there with the sitting up on his own for eating so narrowed his feeding locations down to in his play ring or supported by his Widgey. On Thursday we even managed to get him to eat whilst we were in a cafe, we found this particularly impressive as he's an inquisitive little man and café's can be very distracting. As the week drew on he began to finish more and more of the bowl, C even ended up doubling the portion. Which brings us to today, the first day we decided to introduce a new food, Carrots mixed with baby rice as suggested by friends and lovely folks on twitter. His little face as he realised it was no longer porridge he was sampling, was a picture. 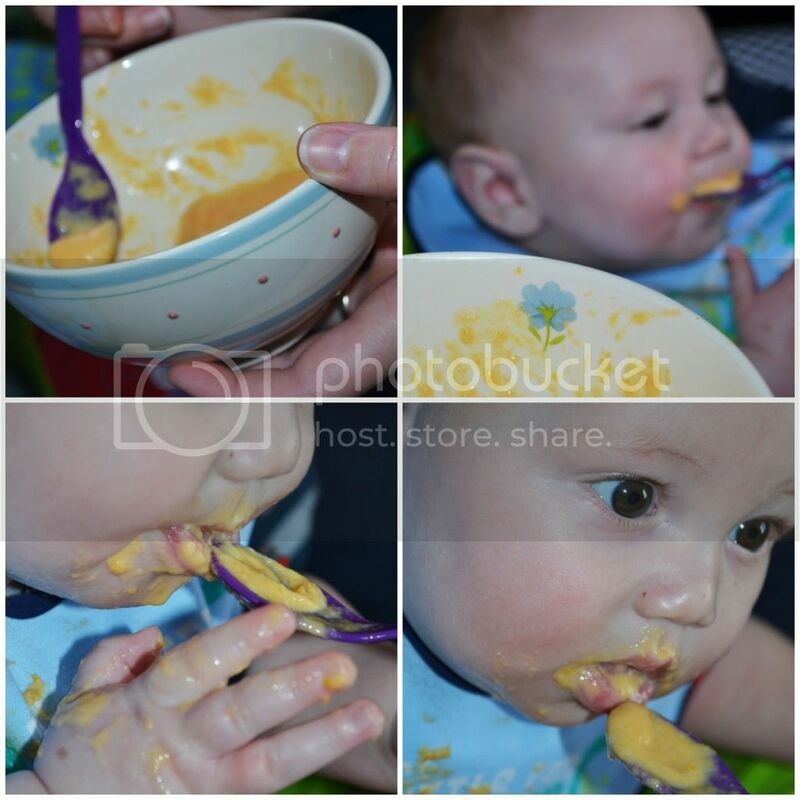 He couldn't get enough and was grabbing the spoon at every opportunity. We are really enjoying this whole new food experience and can't wait to introduce more foods each week. What was your baby's favourite food? Awesome! Glad he’s doing well. I gave E a little sweet potato the other day and the look on his face was priceless! It’s so exciting isn’t it! My boy loved his Christmas turkey pie that his grandad made on Boxing Day. I’m often too busy to cook but I’ve started setting aside a little food when I do cook so Jack can try it. Those first weeks are so much fun and I think everyone makes mistakes but you learn just as quickly as they do. Bet it seems like a lifetime ago now?